It’s almost becoming a chore to write reviews of Super Sons. Not to read the book, no that is no problem at all. The problem lies in trying to find new ways to convey how superb it is, and how much fun it is to immerse oneself in the tale. 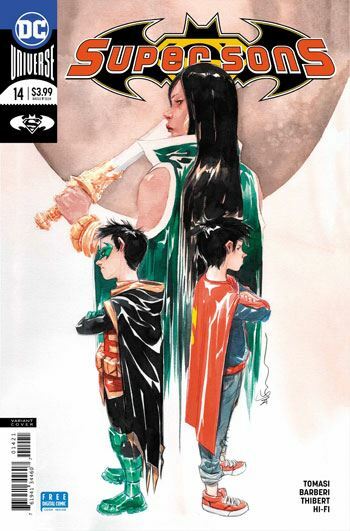 Tomasi, Barberi and Thibert conclude the story begun in the previous issue, pitting Talia Al Ghul against Lois Lane, and putting the Super Sons into the middle of the fray. The story very nicely balances action and comedy, largely splitting these between the boys. Superboy keeps an eye on his mother, while plunging into really stupid lies when she finds him. Damien, on the other hand, takes the lead in fighting his mother, keeping her from completing her attack on Lois. The art is perfectly suited to the tale. It’s very bright and dynamic. The figures look a bit too idealized, but a level of stylization is almost required for this book, and I have no problems with it. 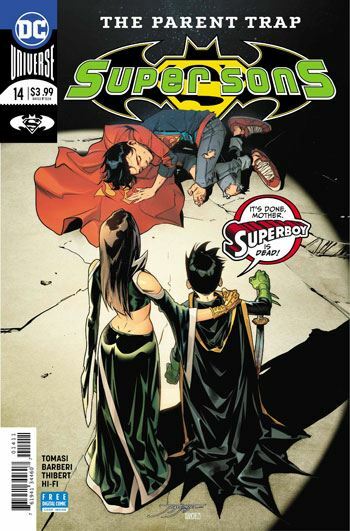 As with every issue of Super Sons, what makes it sing is the dialogue between Superboy and Damien. The pair work so darn well together, and Tomasi seems inspired when he scripts their discussions. The mothers come off well also. Lois Lane’s role is nothing out of the ordinary, but Talia gets some interesting development. Yet another winner, this book is on such a roll.